Weald Country Park Stick Man Play Trail01277 261 343work Nature TrailJoin us at Weald Country Park for the Stick Man Play Trail. Designed by leading natural play specialists Infinite Playgrounds, it brings the popular book by Julia Donaldson to life. In the story, Stick Man has many adventures in his journey to return home to his family tree. The permanent trail is approximately 2km in length and consists of a number of climbing frames, slides, swings, Stick Man’s family tree and a giant swan’s nest. The equipment is located near the visitor centre and in locations specifically chosen to maintain the natural beauty and outstanding views within the park. We hope that the trail will help children and their families enjoy challenging and imaginative play. The Stick Man play trail is open to everyone and free to use during park opening hours throughout the year. There is a charge for car parking but costs go back towards maintaining the park and protecting its wildlife. For details of special themed trails taking place throughout the year, please visit our website. 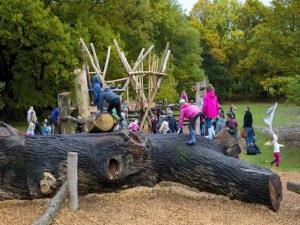 Join us at Weald Country Park for the Stick Man Play Trail.